GHX is an innovative value-added distributor of a full range of industrial gaskets and hoses. 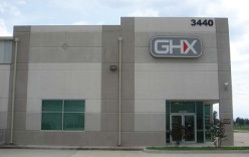 Our extensive inventories include rubber, metal, composite and hydraulic hose assemblies fabricated at all GHX locations. Gasketing materials, covering the broad spectrum of flange applications in the process and other industries, are made to order as customer needs arise. Packing's, expansion joints, O-rings, hose fittings and textile products enable GHX to provide outstanding service to our customers, no matter how large or small their sealing needs. Extensive product knowledge and manufacturing expertise, in conjunction with comprehensive inventories and strong working relationships with major quality manufacturers, provide GHX customers the assurance that they are being served by one of the best in the industry. To facilitate the movement of customer orders through the GHX Business Management System and to meet the challenges of today's MRO (Maintenance, Repair and Operations) marketplace, we have installed state-of-the-art computerized systems to maximize efficiency and assure on time delivery. GHX welcomes the opportunity to demonstrate how we can serve your fluid sealing and transfer requirements as a quality driven, value added supply partner. We are “The Expert Fit” for your business needs. GHX Industrial is committed to achieve the highest performance in Operational Excellence, this will be achieved through demonstration of leadership, ethical behavior, and compliance to regulatory and statutory requirements. GHX Industrial is performing its operations in a manner that protect the community, environment and maintains the integrity of the company’s human, assets and financial resources. Consider Quality, Health, Safety, and Environment as first priority while performing any task. Exchange best practices aiming operational excellence. Demonstrate personnel commitment toward the prevention of employee injury, and non-productive time. Follow legislation, regulation, standard and other applicable requirements including customer requirements. Engage and empowering staff throughout the organization. Develop, maintain, and continually improve an Operational Excellence Management System. This Policy is enforced and implemented at all GHX Industrial locations.